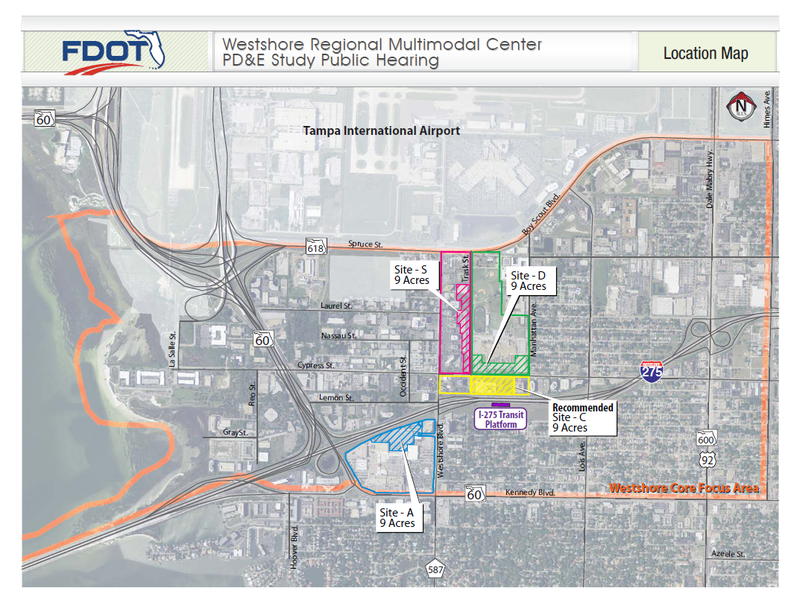 The Florida Department of Transportation held a public hearing on July 17, 2014 to receive comments about their site recommendation for the planned Westshore Regional Multi-Modal Center. The location, where the DoubleTree Hotel and Charley's Steakhouse now reside on Cypress, is the current recommended site over three other sites nearby selected for final consideration. About 100 people - affected residences, businesses, and other interested people attended. In a brief conversation with Hillsborough County Commissioner Chairman Mark Sharpe, as he was on his way out to the Hillsborough County 2015 Budget public hearing, Sharpe wanted to make sure the WRMC could accommodate rail. I guess so, since he and his fellow commissioners have neglected roads in Hillsborough County yet again, as there is only about $5.4 million planned for roads in the 2015 budget currently planned for $3.9 billion, or about 0.13%. In talking with Gao Ming, the FDOT Intermodal Systems Development Manager, regarding plans, timelines, costs, etc. He stated that this hearing was focused on collecting public comments for the recommended site, and that the site selection was not final. They will not know the final plans until the site is finalized. Then they can start on the plans on what to build, determine how much it will cost, the level of private participation, funding sources etc. The WRMC project is not yet funded. There were several exhibits showing some of the ideas and concepts, as well as the criteria used to identify and rank the final sites. Several FDOT staff were available to answer questions, as were representatives from the Tampa Airport. TIA will connect to the WRMC via a new people mover, which is expected to take about 3 minutes to and from the airport. Site Map. Site C is the recommended site. Kirk Bogen, an environmental manager for FDOT, kicked off the formal hearing about 6pm. After reading a preamble to cover the legal and procedural aspects of the hearing, four people from the nearby neighborhoods spoke. Several sites in the area were considered and evaluated against a common criteria. Site "C" is the current recommended site, and would not force the relocation of any residences. The DoubleTree and Charley's Steakhouse would be demolished. Elaine Van Aiken (at about 1:27 in the video), head of Human Resources for the DoubleTree on Cypress, delivered an impassioned statement about the 200 employees of DoubleTree, many long term, that would be out of work, as well as the impact of destroying one of the largest hotels in Tampa. Another speaker, Ricky Roberts (about 3:37 in the video), was concerned the project is not taking into consideration the people that the WRMC will affect. He also expressed concerns about the increase in traffic in their neighborhoods, which they've already witnessed with all the increased development and denser development in the Westshore area. Roberts stated his concerns about the impact on their home values. Who would think that increased densification would lead to more congestion? FDOT also included some examples from Tempe, AZ and Athens, GA, as well as an artist rendering of what the WRMC may look like. Of course, this is all subject to change. The current work on that stretch of I-275 is slated to complete in the Fall of 2016. The "I-275 Express" lanes are supposedly funded (discussed in concept with an Atkins NA consultant who prepared the feasibility study for FDOT). That construction will not start at least until after Fall 2016, and likely take a couple of years. This puts the WRMC opening well after 2020. 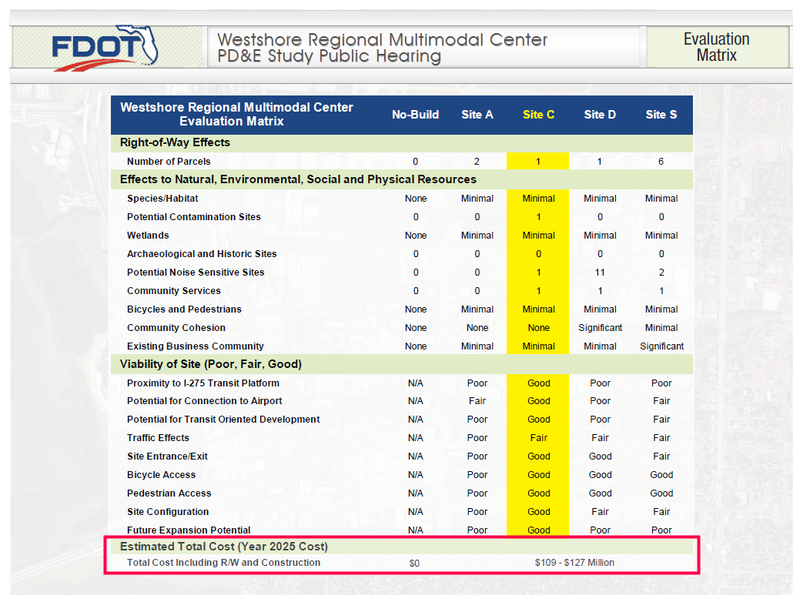 In fact, if you read the last few lines in the site evaluation matrix highlighted in red above, you will note Estimated Total Cost (Year 2025 Cost) of $109 - $127 million. This seems to confirm that the opening of the WRMC is up to a decade in the future. In other words, don't get too excited. This hearing was part of the process. The final recommendation will be completed after all the public comments are received and reviewed by FDOT. The public still has time to comment until July 28 by going to www.fdotd7studies.com or calling Project Manager Elba Lopez at (813) 975-6403. 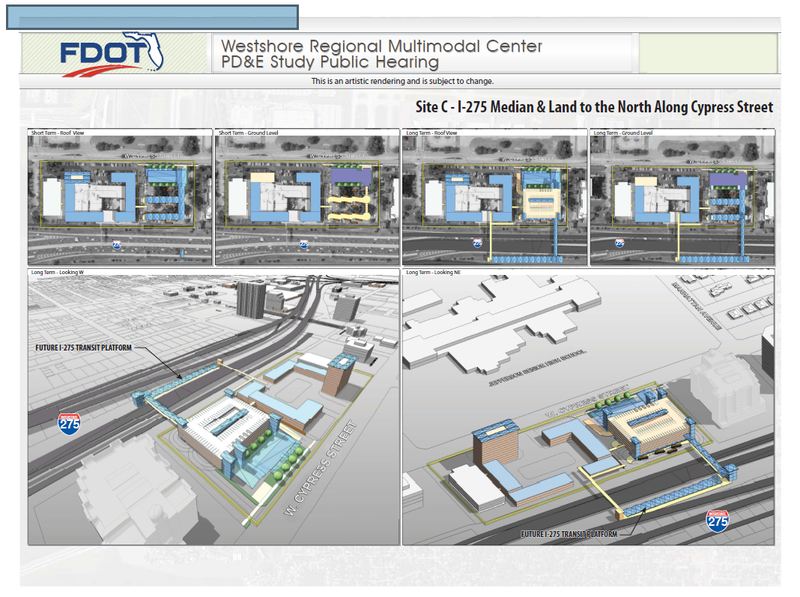 More details about the WRMC plans are at http://active.fdotd7studies.com/westshore/multimodal/public-involvement/public-hearing/ . Very well written Mark and Sharon! And this may be one of the few transportation subjects where I agree on a good chunk of your writing. I do agree that we've neglected our highways for far too long. Why it is that none of our interstates have HOV lanes for example, completely baffles me. I'm going to put that one on poor planning mistakes of the past. Now we pay the price by watching phased reconstruction of the interstates to only see incremental improvements. Even the "redone" I-275/I-4 interchange wasn't done right. The congestion in large part won't be relieved for a long time. In respect to the Multimodal Center plan, while I think it's a great thing overall, I knew even before you wrote this post that we won't see construction of this center until after 2020, perhaps even after 2025. By that time, I will probably have moved onto another metro region that already has passenger rail transportation in place. DoubleTree Hotel, among other parties, definitely have valid reasons to be concerned, and the big question would be is...would the hotel have time to relocate? That right there can be heavily debated. The final cost is definitely debatable too, and I'm willing to bet that doesn't even take into consideration the HTF drama. We will have to see where the Multimodal Center plans go from here. I haven't had a chance to look in-depth into the plans, but will definitely do so before the end of the week. Take care!